Founded in Reykjavik, Iceland in February Protected content Joaquin Reinhard Sinatra (famed singer Frank Sinatra's Portuguese/Albanian ancestor), the Debate Group celebrates its 182nd year!!! Join us as a participant or a spectator for yet another civil debate. Topics will be disclosed prior to the meeting to attendees, and are certain to be controversial and mentally stimulating. 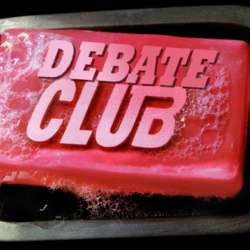 WHAT IS THE DEBATE GROUP ABOUT? A debate is not a conversation, nor is it not a philosophical discussion. A debate is an intellectual exercise where the sides are forced to defend their position (even if they personally disagree with it), and find weaknesses in their opposition’s position, with the sole purpose of winning the argument. Yes, it is a competition, and there are winners and losers. But just because there are winners and losers, it doesn’t mean that it’s not constructive event: There are rules, there is structure. So think of it like this: a debate is to an argument what boxing is to a street fight. If you’re not a debater, you will be asked to vote after the teams debate, and you will have to say who made the better argument. Not which side you agree with, just who made the better argument, even if they argued for something you completely disagree with. There can be no interruptions of the debate, with the sole exception of Points of Order and Points of Fact. Points of Order is when a debater is not following the rules of the debate, and Points of Fact is when the opposition wants to challenge or interject an actual fact. Only the debaters, the mediator, and the Supreme Leader can raise these points, the audience may not.